Mac Daddy Mac n Cheese! Preheat oven to 350 degree. Grease a 9 x13 baking dish. Prepare pasta according to box directions. Slowly add in cream. Increase heat and let it cook for about 10 minutes to thicken. Add in cheddar cheese and stir until melted and smooth. 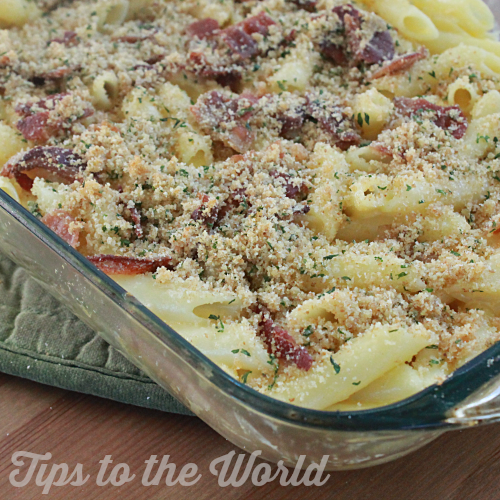 Mix cheddar cheese sauce with cooked pasta and pour into baking dish. Sprinkle on top of pasta. Bake for 20-25 minutes or until bubbly and lightly brown. Uh, hello!! Love mac n cheese. I found your recipe over at the Treasure Box Tuesday link party. I host Tickle My Tastebuds Tuesday and would love it if you linked up this recipe. I’m sure our party goers would love it as much as I do. Here is the link http://bit.ly/1l4cu0j. Have a wonderful day! !